Description: Jehoiachin reigned a mere three months before Nebuchadnezzar took him into exile. He was one more Judean king who did evil in the eyes of Yahweh, and his one recorded action as king was to surrender to the Babylonians. How significant can a king be whose reign ended when it had scarcely begun? Remarkably, unlike his uncles, Jehoahaz and Zedekiah, Jehoiachin did not disappear after his removal. Instead, he became the focus of ongoing prophetic discussion about the monarchy, his rehabilitation by Evil-Merodach was a turning point in the exile, and his offspring was eventually identified as the future of David�s line. The attention paid to Jehoiachin in the canon is the seed of Patton�s study. Why is there such interest in a king who was so insignificant politically and who�literarily speaking�is a rather flat character? What significance do particular biblical books attribute to him, and why? If we expand our purview to the Bible as a whole, another reason for investigating Jehoiachin emerges. The exile was one of the most significant events in the history of Israel. In its midst, Jehoiachin occupies an important position as both one of the last kings of Judah and one of the first exiles. Are there ways in which biblical writers capitalize on Jehoiachin�s unique position for their broader theological purposes? Going one step further, in Hope for a Tender Sprig, Patton pursues not only the diversity of the Bible but also its unity, suggesting that �salvation history� is useful for conceiving the unity of the Bible, especially when we are concerned with a historical figure such as Jehoiachin. If the various books of the Bible bear witness to one grand storyline, what is the significance of Jehoiachin within that story? In the light of the canon as a whole, can we synthesize the various perspectives on Jehoiachin and articulate his distinctive role in this grand narrative? These questions beg many others. What do we mean by �canon�? What grounds do we have for considering the canon as a unity, and why should we consider �salvation history� a valid paradigm for understanding it as a whole? What is the relationship of salvation history to �real� history, and is this even a valid question? What role will extrabiblical evidence (some of which concerns Jehoiachin directly) play in our investigation? Patton addresses these issues and arrives at a comprehensive biblical-theological reflection on Jehoiachin�s significance. 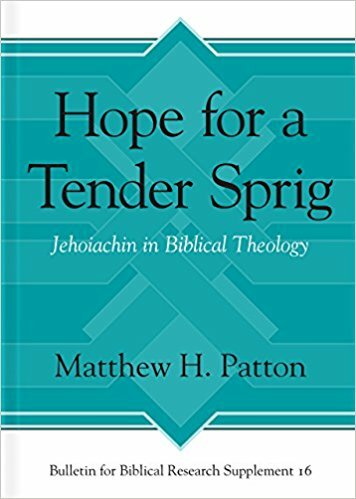 Citation: George Athas, review of Matthew H. Patton, Hope for a Tender Sprig: Jehoiachin in Biblical Theology, Review of Biblical Literature [http://www.bookreviews.org] (2018).